On Princess Aisya 17th birthday and coronation day, a giant flaming serpent appeared, reducing the country of Millinear to ash. Only Aisya survives the attack. When she is attacked by a flaming monster, her guardian and regent Bullnequ mysteriously resurrects from the ashes. Now Aisya and Bullnequ must travel across the world, reviving her people and solving the mystery of the ash. Movement is limited by a grid. Characters in the player's team can only move a certain number of spaces in a single turn. This is determined by your "AP", which depletes as you move and complete actions. 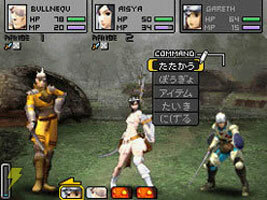 Enemy combat is handled using an RPG menu system.